Officials in Santiago, Chile restrict car use to combat the city's rising air pollution levels. Photo by Jorge Gobbi. A version of this post was originally published by Maria Fernanda Cavalcanti in Portuguese on TheCityFix Brasil on June 27, 2011. Air pollution in the capital of Chile has reached alarming rates, forcing the city to declare a Level 2, pre-emergency, environmental alert on Monday, June 27, 2011. Previously, the government of Santiago had declared a second pre-emergency environmental alert in early June. Air monitoring stations recorded pollution levels at 300 to 500 micrograms per cubic meter of particles hazardous to health, exceeding the World Health Organization (WHO)‘s acceptable levels of 50 micrograms per cubic meter by a factor of ten. In response to the current levels of air pollution, officials have been enforcing vehicle use restrictions. The decision restricts the movement of 20 percent of vehicles around the perimeter of Santiago, which corresponds to about 310,000 fewer cars on the streets. About 800 industries have been paralyzed by the measure. In addition to the closing of factories, residents are discouraged from using wood and biomass heating until further notice from the local government. Air pollution in Santiago is exacerbated by a lack of rain in the region. In fact, Santiago did not receive any rain in the month of May, contrary to the city’s “normal” May conditions, which feature 1.8 inches of rainfall. Forecasters, however, have been optimistic that June will bring at least a little amount of rain to the city. Indeed, there is a 70 percent chance of rain for Santiago in today’s forecast. 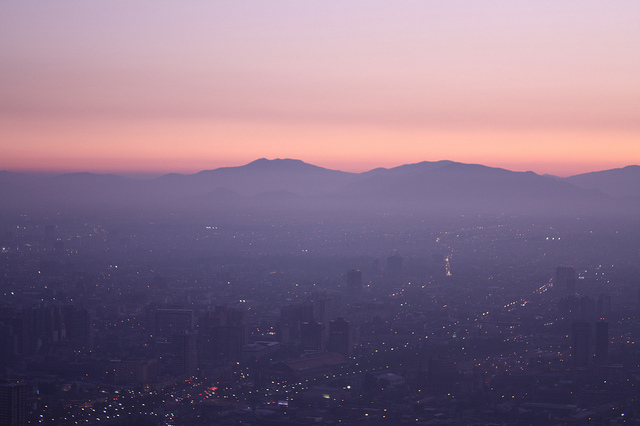 Santiago’s air pollution has taken a toll on public health. Emergency services saw a 23 percent increase in patient admissions, of which 80 percent were respiratory diseases. The city has also seen an unusually early presence of syncytial virus, which causes respiratory infections and can be fatal in children under six months old. Further alarming is the increasing rates of whooping cough, four times the usual rate to be exact, another threat to infants. To mitigate the rise of health issues in children, the city-issued Level 2 alarm suspends outdoor physical activity classes and cancels after-school events. In addition to a growing population, an increase in car usage and a climate with nominal rain, Santiago is also doomed to air pollution because of its geological location. Set between mountains, the lack of wind also contributes to the settling of harmful pollutants.